CAIRO (PAI) – Egypt’s independent unions and their confederation, praised by the AFL-CIO for their role in peacefully ousting strongman Hosni Mubarak during the “Arab Spring” more than two years ago, are extremely upset by present Egyptian President Mohammed Morsi’s labor takeover plan. Morsi’s Decree 97 would rewrite Egypt’s labor law to let the nation’s Manpower (Labor) Minister, now a member of the president’s Peace and Justice Party, name enough leaders to control labor federation boards, among other changes. The decree says the minister may replace any federation board members aged 60 or over with second-place finishers in regime-run 2006 elections for board seats. But if there was no second-placer – and that was the case for most of the races – the minister would name a replacement. New labor board elections, scheduled for last month, were postponed for six months. Morsi’s labor takeover plan accompanied other decrees giving himself sweeping powers over parts of the government, notably the Mubarak-era judiciary, that his party and its parent organization, the Moslem Brotherhood, do not now control. “These decisions were made by a head of state who came to power through elections, the results of which everyone accepted, and which appeared to mark the restoration of a state of law. But as soon as he and his organization came to power they forgot what they had promised, and forgot the people had offered up martyrs in the cause of dignity, freedom, bread and social justice” the teachers union added. 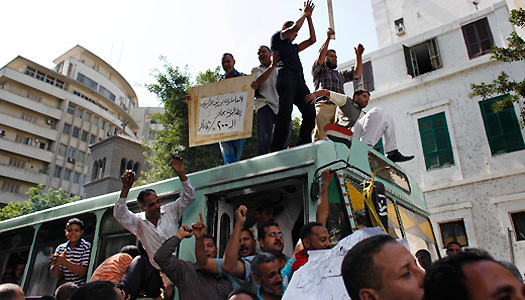 Morsi’s draft constitution lacks worker representation in parliament. “Workers are represented in this Constituent Assembly by the Minister of Labour, Khalid al-Azhary. Can anyone who has seen his performance during his time in office believe that he will defend workers’ rights?” EFITU asked. Al-Azhary is a member of Morsi’s Peace and Justice Party. “We are not basing this on guesswork: All the drafts which came out of the Constituent Assembly have been completely empty of rights for workers, peasants, fishermen, and workers in informal jobs. The articles which mention workers and social justice do not commit anyone to actually implementing anything – not the government and not the bosses,” added EIFTU, which has 2.5 million members. “At the same time, the drafts protect the interests of factory owners and company directors. At present we find bosses refusing to pay workers’ wages and sacking them, or issuing orders to close down the factory and throw workers out of their jobs, even when they have enjoyed privileges and tax exemptions. They even took out bank loans and never paid them back! EFITU board member Fatma Ramadan told the leading independent newspaper, Al Masry Al Youm, “Morsi’s first decree, following his complete takeover of state powers, is a labor decree. This is a clear indicator that Morsi is seeking to monopolize the labor movement by first ‘Brotherhoodizing’ the Ministry of Manpower, and now the Egyptian Trade Union Federation,” Egypt’s 4-million-member “official” labor federation.